At Aug 5, 2005, 2:40 P.M. a Bavarian princess was born. Oh my gawd, she’s a Leo! No wonder with that mane of hair and that little cat face. Mew! I haven’t named her yet. 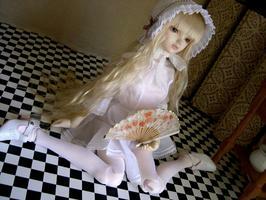 Originally she was going to be Parisian, as her bio from Volks states. But she looks so like a 19th century German postcard that I had to throw out my potential name list and start a-fresh. I was trying to get nice clear arrival shots, but with Biscuit AND Miette helping… sigh. No such luck! 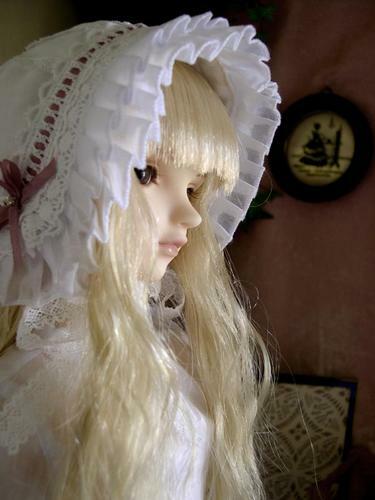 Funny story about Miette’s wig… I bought it from Aimee and it came yesterday. I immediately plopped it on Miette’s head. Picture perfect! Thank you, Aimee! Anyway, when I got up this morning the li’l girl was bald! The wig was no where to be found. Biscuit! On the table, under the table. Nada. Lucky for us he is pretty predictable and squirrel’s all his treasures away underneath our bed. I looked and didn’t see it. As I was getting up something brown caught my eye, it was over by my nightstand on my side of the bed. It was like Biscuit was trying to return it but forgot where he had stolen it from. Bad kitty! Now… back to the peektures! I’m giddy with glee as I lift off the layers of paperwork, outfits and cushions and… eeeeeeek! No wrapping or protection, her face protector is completely off, as well as her chin foam. Miette is shocked, just shocked! A thorough inspection and she appears to be just fine. Whew! All that fuss and all Biscuit really wanted was the empty shipper. What can I say, she is exquisite. Volks out does itself every time. Her facepaint is reeeeally lovely and delicate. I’ll probably only redo the brows and kallistify her coloring a bit over the top. She’s sitting here in front of me and I still can’t believe she’s here! Her outfit is another bit of batiste perfection. I love it so much… and more bloomers! Mew! I love the shoes, Volks has DEFINATELY improved on shoe quality the past couple years. And the wig… it is like angel hair! Very soft and light and floaty. Everything about her is a keeper. Demelza was like that, Lady Sylvie was the perfect package! But her I got in parts… first the outfit, and the dolly, bald and naked, many months later. Lizzie is brand spankin’ new. So fresh! p.s. extra special thanks to all the warm fuzzies everyone posted yesterday about our Anniversary. Smoochies! 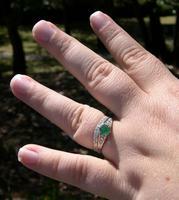 And, since several asked… here’s the ring! eep. the camera adds 10 lbs to my hand. Oh, what wonderful news. Congratulations on your newest treasure; she’s beautiful! Oh Kallisti! She’s pure poetry – congrats! I’m so happy for you. PS – tried to post a happy anniversary message to you but kept getting blocked – I swear it wasn’t nasty 😉 Happy b-lated Ani to you both! Had much more to say, but my entry was denied, ah well. congratulations on your anniversary and your loverly new dolly! Yay! Congratulations on your new arrival! She’s beautiful! Squeak! *cries* She’s so gorgeous! Where do you order all these beautiful dolls from?